Not surprisingly, evidence of personality has been found in other primates. The human Five-Factor Model (FFM) has been used to investigate personality in chimpanzees, gorillas and orang-utans. Chimpanzees can also be differentiated from each other by their ‘behavioural signatures’, including propensities to set upon or affiliate with other chimpanzees, anxiety and arousal in stressful situations, curiosity toward novel foods and objects, impulsivity, goal pursuit, and physical and sexual activity. Like chimpanzees, gorillas can be differentiated by their behavioural repertoires . 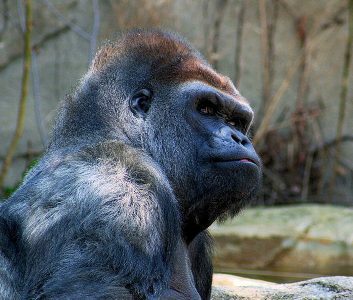 Gorillas’ personalities have also been described using aspects of the human Five-Factor Model (FFM) model although gorillas’ personalities were not found to have Openness and Conscientiousness dimensions like humans and chimpanzees. Scientists have since asked whether gorillas really differ in levels of curiosity and self-control, or whether researchers were just not looking for variation in these traits. Orangutans’ personalities have also been studied using the FFM and have described with the dimensions Dominance, Extraversion, Agreeableness, Neuroticism, and Intellect. Intellect appears to be a blend of Openness and Conscientiousness . Aspects of personality have also been found in other primates such as macaques, vervet monkeys and langurs.